When the Earth rumbled and high rises swayed on Sunday afternoon all over Southern California and parts of Arizona, most people were sure that the "Big One" had hit. This major temblor is expected to rip through the southern end of the San Andreas Fault and race northwest along the fault line causing damage and devastation on its way (see blog November, 10 2008). But when Sunday's swaying motion stopped and seismologists in Southern California Seismic Network's data center in Pasadena checked their records, it very quickly became clear that the "Big One" is still to come. 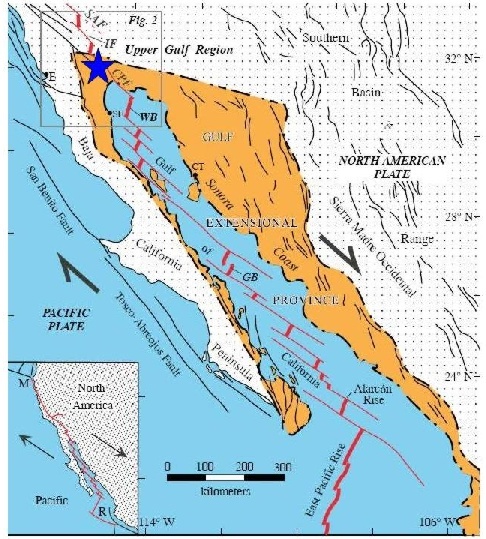 Instead, the shaking was caused by a magnitude 7.2 quake south of the border, with its epicenter near the village of Guadelupe Victoria in the Mexican state of Baja California, about 35 miles south of Mexicali and 100 miles east of Tijuana. Guadelupe Victoria lies quite a ways south of the southern tip of the San Andreas Fault (see blog November 4, 2008), roughly halfway between the Salton Sea and the northern end of the Gulf of California. From a geologist's point of view, this area is rather unique, because it marks the transition zone between two completely different tectonic regimes. All of California, from Cape Mendocino in the north to Cabo San Lucas at the southern tip of Baja California is dominated by the boundary between the Pacific and the North American Plates. North of the US-Mexican border, this boundary is represented by the San Andreas Fault system, along which the two plates slide past each other with a speed of about 2 inches per year. South of the border, the picture is completely different. When looking at a map of northwestern Mexico, did you ever wonder about the fingerlike peninsula Baja California? How did this almost 800 mile long, extremely narrow stretch of land come into being? The cause lies under the seafloor of the Gulf of California, which separates Baja from the Mexican mainland. 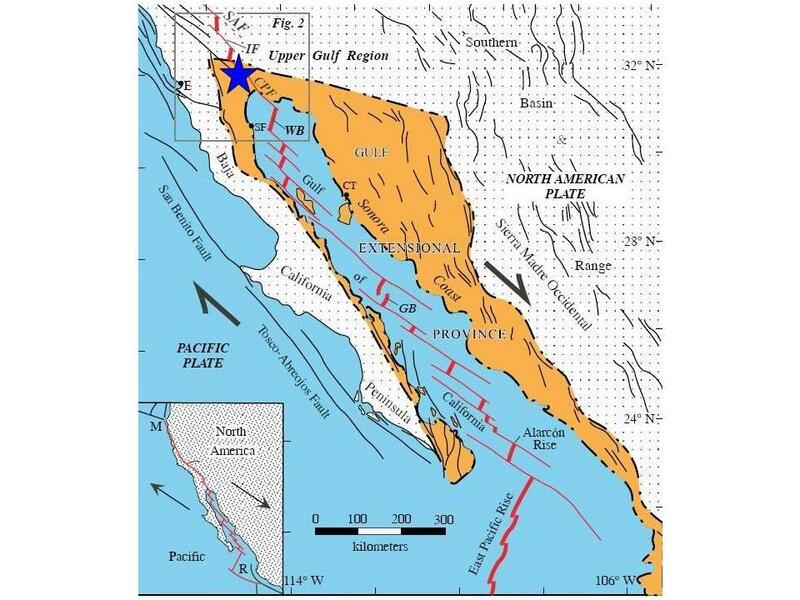 In this area the East Pacific Rise (EPR) rules the boundary between the two plates. Like the Mid Atlantic Ridge or the Red Sea Rift, the Earth's crust splits apart along the EPR. This split causes Baja - located on the Pacific Plate - to move westward, slowly drifting away from the Mexican mainland at less than 2 inches per year.